Back in a simpler time - before the iPhone, Facebook, and Jon and Kate Plus 8 - my parents weren't divorced. And during this time, approximately twice a summer my parents would bring home "steamers" - fresh clams you would take out of the shell, remove this weird black residue from, and eat in garlic butter. Somewhat hard work, but delicious. One big happy family. Steamers. As an avid seafood fan, I was hit with both nostalgia and delight when seeing the new TJ's Frozen Steamers at the Brooklyn location. I bought some (under five dollars, I believe), put them in the freezer, and forgot - until this Monday, when I microwaved them for the instructed five and a half minutes and put them in a pasta with mushrooms and lackluster oversized frozen Trader Joe's broccoli. But this isn't a review about broccoli (if it were, I'd give it five out of ten stars). It's about steamers. And these were mediocre. There was no payoff for the hard work of de-shelling every clam, and the mild embarrassment and smell of eating shellfish in a tiny shared office. There was a fair amount of grit - sand? broken shell? - in the steamers, and they just didn't taste that great. 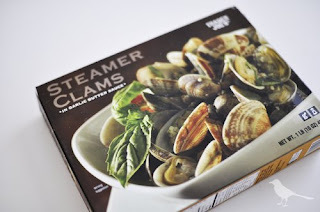 Trader Joe's has otherwise great fish products (mahi tuna, seafood cakes, and according to Jamie, the fish sticks), and so it's best to leave the fresh shellfish to the beach and my family's past to the past, and not recommend this product.